Contemporary architecture and urban space in Iran registers itself between two extremes of modernity and tradition. 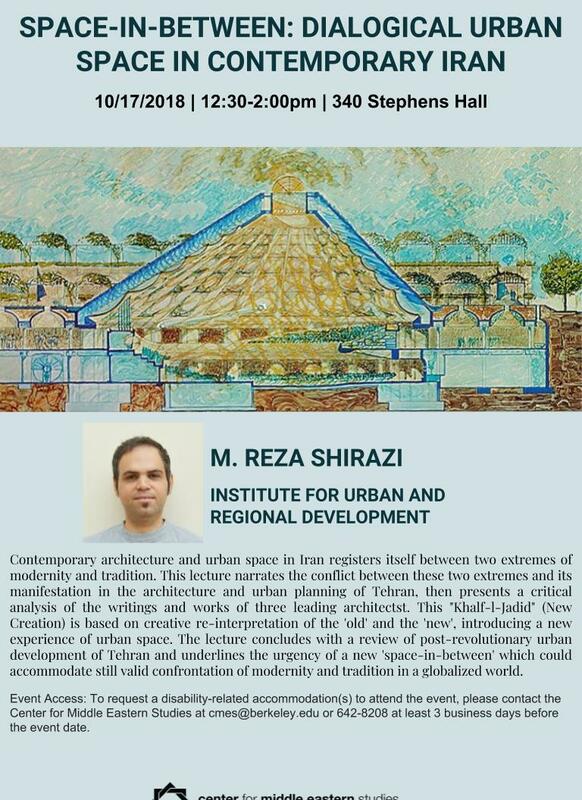 In this lecture, I first narrate the conflict between these two extremes and its manifestation in the architecture and urban planning of Tehran starting from mid-19th century. I then present a critical analysis of the writings and works of three leading architects, Kamran Diba, Nader Ardalan, and Hossein Amanat, and show how they have been able to create a 'space-in-between' where tradition and modernity establish a constructive space of exchange and dialogue. This "Khalf-l-Jadid" (New Creation) is based on creative re-interpretation, but not re-production, of the 'old' and the 'new', introducing a new experience of urban space. I will conclude with a brief review of post-revolutionary urban development of Tehran and underline the urgency of a new 'space-in-between' which could accommodate still valid confrontation of modernity and tradition in a globalized world. A Senior Research Fellow at the School of the Built Environment, Oxford Brookes University, M. Reza Shirazi is currently a Marie Sklodowska-Curie Global Fellow at the Institute for Urban and Regional Development, UC Berkeley, where he serves as the Principal Investigator of the EU-funded project entitled '(Un)Just Neighborhoods: Socio-Spatial Justice in Urban Neighborhoods'. Reza's research and teaching interests lie in the field of socio-spatial justice, discourse studies, neighborhood development, citizen participation, phenomenology of the built environment, socio-cultural sustainability, and architectural and urban transformation in the MENA countries. Reza has been awarded several research grants and fellowships including Marie Curie, Gerda Henkel, Alexander von Humboldt, and DAAD. Reza's recent books include: Urban Social Sustainability: Theory, Practice and Policy (Edited Book, Routledge, Forthcoming), Contemporary Architecture and Urbanism in Iran: Tradition, Modernity, and the Production of 'Space-In-Between' (Springer, 2018), Citizens' Participation in Urban Planning and Development in Iran; Challenges and Opportunities (Edited Book, Routledge, 2017), and Towards an Articulated Phenomenological Interpretation of Architecture: Phenomenal Phenomenology (Routledge, 2014).